In case you’re planning to fly with Qatar Airways, and assuming you can afford it, buy first-class tickets so you’ll get a chance to check out their Premium Terminal at Doha International Airport. It was rated as one of the best first-class lounges for 2007 by Skytrax, the iindependent airline industry’s monitoring agency. It opened last November 26, 3006, a week before the start of the 15th Asian Games that took place in Doha, Qatar. The 10,000sqm Premium Terminal was built in just nine months, at a cost of US $90 million, as part of a US $200 million expansion at Doha International Airport. Designed to pamper and delight First and Business Class passengers, the terminal is open 24 hours a day, seven days a week. It’s located before the main departures building. As one of the privileged First Class passengers, you’ll experience the Premium Terminal as another choice destination of your trip, rather than being simply a waiting room for your flight. There’s a concierge to welcome you assist you. 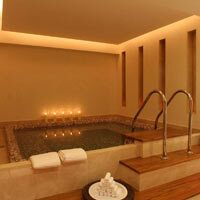 You’ll have access to the spa treatment rooms, Jacuzzi, sauna and massage treatment rooms. For shopoholics, there’s duty-free shopping. There are fine dining restaurants with a wide choice of hot and cold Arabic and international cuisine. For business travelers, there’s a business centre with free internet access stations and secretarial services, as well as the use of conference and meeting rooms. And for families with kids, there’s a nursery and a dedicated play area for older kids. 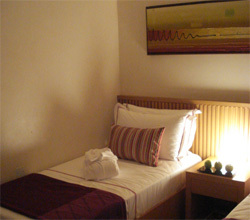 You can even leave your kids to the care of nannies while you shop or relax to your heart’s content. There’s also a 24-hour medical centre manned with doctors and nurses. And if all these still sounds like too much work for you, you hibernate in their exclusive sleep cabins, then freshen up with a shower when your flight arrives.